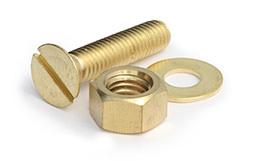 When replacing fasteners, it is generally best to match what you are replacing. Replacing a bolt with a stronger one is not always safe. Harder bolts tend to be more brittle and may fail in specific applications. Also some equipment is designed so that the bolts will fail before more expensive or critical items are damaged. In some environments, such as salt water, galvanic corrosion must also be considered if changing fastener materials. For more information see our About Galvanic Corrosion page. It is a common misconception that stainless steel is stronger than regular steel. In fact, due to their low carbon content, many stainless steel alloys cannot be hardened through heat treatment. Therefore, when compared to regular steel, the stainless alloys used in bolts are slightly stronger than an un-hardened (grade 2) steel but significantly weaker than hardened steel fasteners. Unless great care is taken, stainless fasteners are susceptible to seizing up during installation, a phenomenon known as galling. Most stainless steel fasteners are much less magnetic than regular steel fasteners though some grades will be slightly magnetic. 18-8 refers to any stainless steel containing approximately 18% chromium and 8% nickel. This is the most common stainless designation for hardware. For information on 18-8 stainless steel material properties see our Material Grade Identification and Properties Chart. Steel is the most common fastener material. Steel fasteners are available plain as well as with various surface treatments such as zinc plating, galvanization, and chrome plating. Bolts are typically marked on the head to show what grade bolt they are. For a list of the most common grade markings see our Material Grade Identification and Properties Chart. Note that, in addition to the grade marking, many bolts also have a manufacturer's mark. Grade 2 is a standard hardware grade steel. This is the most common grade of steel fastener and is the least expensive. Except a possible manufacturer's mark, Grade 2 bolts have no head marking. Grade 5 bolts are hardened to increase strength and are the most common bolts found in automotive applications. Grade 5 bolts have 3 evenly spaced radial lines on the head. Grade F is roughly equivalent to Grade 5. 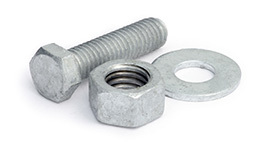 Grade F nuts are used with Grade 5 bolts. Grade 8 bolts have been hardened more than grade 5 bolts. Thus they are stronger and are used in demanding applications such as automotive suspensions. Grade 8 bolts have 6 evenly spaced radial lines on the head. Grade G is roughly equivalent to Grade 8. 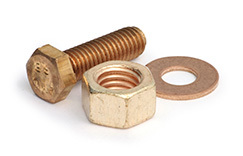 Grade G nuts are used with Grade 8 bolts. Alloy steel bolts are made from a high strength steel alloy and are further heat treated. 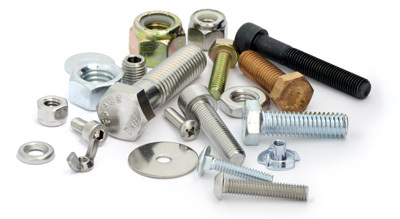 Alloy steel bolts are typically not plated, resulting in a dull black finish. Alloy steel bolts are extremely strong but very brittle. Brass is an alloy of primarily copper and zinc. Brass is highly corrosion resistant and electrically conductive. However, its use as a fastener is somewhat limited due to its relative softness. It is used primarily for its appearance. Aluminum is a light, soft, corrosion resistant metal. Like stainless steel, aluminum's corrosion resistance is inherent to the material. Therefore, scratches and nicks will not effect the corrosion resistance. Fasteners are made from a variety of aluminum alloys, with elements such as manganese, silicon, iron, magnesium, zinc, copper, and silicon being added to increase strength and melting point. Rivets are often made from aluminum alloys in the 5000-series, which uses magnesium as the primary alloying element. Many steel fasteners are electroplated with zinc for better corrosion resistance. Fasteners that have been zinc plated have a shiny, silvery or golden appearance, referred to as clear or yellow zinc respectively. They are fairly corrosion resistant but will rust if the coating is destroyed or if exposed to a marine environment. Galvanizing is another coating involving the application of a layer of zinc. Hot dip galvanizing puts the thickest possible coating on the metal, resulting in superior corrosion resistance. Due to the thickness of the coating hot dipped galvanized bolts are not compatible with other nuts. Galvanized nuts are tapped slightly larger than other nuts to accommodate this coating. Hot dipped galvanized fasteners are frequently used outdoors, especially in coastal environments. Fasteners are chrome plated and polished for appearance. Chrome plating provides similar corrosion resistance to zinc plating. The main drawback of polished chrome is its high cost. If more corrosion resistance is required, stainless steel may be chrome plated, preventing any corrosion should the chrome be penetrated.